Remove the existing lawn and excavate to 75mm below finished height. 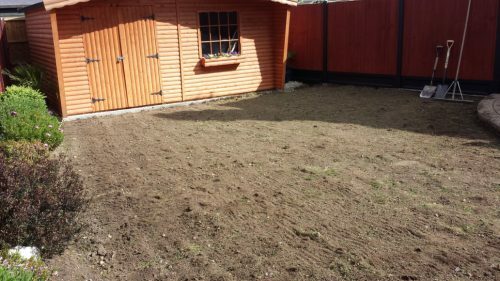 In some gardens, depending on existing levels, you can just remove the existing grass, which would remove around 30-40mm and build up 75mm from there. A turf cutter, which can be hired from your local tool hire shop, will make this step much easier. If there’s not an existing hard edge or wall around the perimeter of your lawn, you’ll need to install some form of retaining edge. For this, you can use either treated timber, steel edging, timber sleepers or brick/block paving. We recommend using treated timber edging where possible as its also perfect to fix the grass to. Timber edging will need to be screwed to wooden stakes driven into the ground with a club hammer or sledge hammer. To prevent weeds from growing through your lawn, lay weed membrane to the entire lawn area, overlapping edges to ensure weeds cannot penetrate between two pieces. You can use galvanised U-Pins to hold the membrane in place. If your existing lawn or garden is particularly prone to weeds we recommend spraying the area with weed killer beforehand. 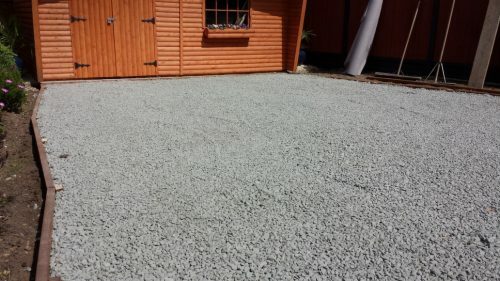 For the sub base, you can use MOT Type 1 or if your garden suffers from poor drainage, we recommend using 10-12mm granite chippings. Rake and level the aggregate to a depth of approximately 50mm. 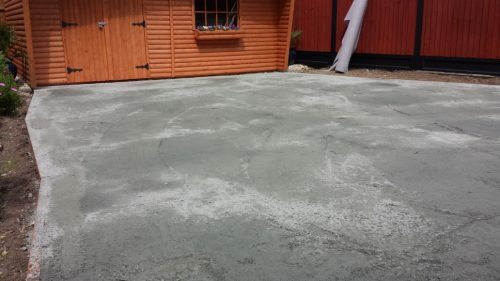 It’s very important to ensure the sub base is thoroughly compacted using a vibrating plate compactor which can also be hired from your local tool hire shop. For the laying course, rake and level approximately 25mm of Granite Dust (Grano) directly on top of the sub base. If using timber edging, the laying course should be leveled to the top of the timber. Again, ensure this is thoroughly compacted with a vibrating plate compactor. Before doing this, we recommend spraying the granite dust with water to keep the dust down and it also helps the aggregate to bind together. Just before laying the grass, we recommend a further weed membrane not only as extra protection against weeds but also as it helps to protect the underside of your NeoGrass and prevents a crunchy sound underfoot when walking across your artificial lawn. As with the first layer of weed membrane, overlap the edges to ensure weeds cannot penetrate between two pieces. Pin the membrane either to the edging or as close as possible and trim any excess. 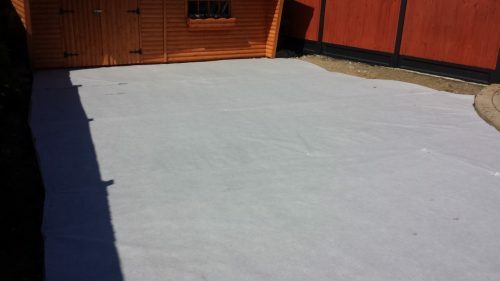 It’s very important to ensure the membrane is laid flat as any ripples in the membrane may be visible through your artificial grass. 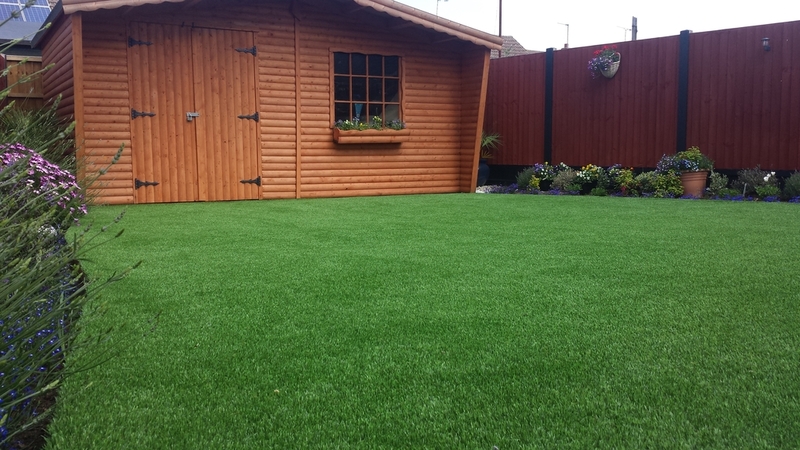 You’ll probably need some help at this point as depending on the size of your artificial grass, it can be very heavy. If possible, place the grass in a position so that the pile direction is facing towards your house or main view point as this tends to be the best side to view the grass from. If you have two rolls of grass, ensure the pile direction is facing the same way on both pieces. Before cutting anything, ensure there aren’t any ripples in the grass and leave it for a couple of hours to acclimatise. Now, using a sharp knife, you can cut the grass to the shape required, carefully following the boundary edge to ensure a snug fit. Blades can blunt reasonably quickly so make sure you have plenty of spares. Secure the boundary perimeter using galvanised nails if using a timber edging or galvanised U-Pins for steel, brick or sleeper edging. If done correctly, joints should be invisible. Firstly, line up both pieces of grass ensuring that the pile direction is facing the same way and that they run parallel to each other. Fold back both pieces of grass by around 300mm to reveal the latex backing. Cut off 3 stitches from each piece of grass being careful to ensure you cut in a straight line. Then fold each piece back over and check that the two pieces of grass meet. There should be a consistent 1-2mm gap. Once both pieces are properly positioned, fold the grass back over again to reveal the latex backing. Roll out the joining tape (shiny side down) between the two rolls and then apply the adhesive (either Aquabond or 2-part adhesive) to the joining tape. Carefully fold back each piece of grass making sure the grass fibres do not make contact with the adhesive or get buried. Ensure there is good contact between the grass and adhesive by carefully walking along the join. Then allow the adhesive sufficient time to cure (between 2-24 hours depending on weather conditions). Lastly, sand dress your lawn with kiln dried sand to stabilise the grass and increase it’s durability. This step can only be carried out when the grass is completely dry as otherwise the sand will clump together. If possible, use a ‘weed free’ kiln dried sand which can be purchased at one of the national DIY hardware stores. We recommend using 5kg per square metre. Then, using a stiff broom or power brush, brush your lawn in the opposite direction to the pile height to brush in the sand and help lift the fibres into an upright position. Finally, grab yourself a drink and admire your new prize winning lawn! 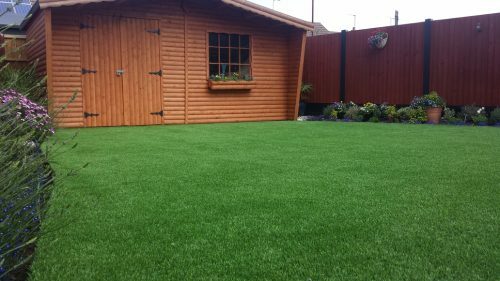 If you are installing your artificial grass on concrete, please check out our step-by-step guide.